The two prints to the left differ mainly in the colors of the doves and the ground. The color scheme of the print on the right (Tsuchiya 2000) shows some other differences. The bad guys, intent on slipping the net of the pledge [of the police] to save the people of the world, were laying low among the tea houses and archery galleries that lined Okuyama within Asakusadera like scales of fish. The police drew their bow on a target they could not miss, in the middle of the night of the 20th day of the month. The bad guys brandished swords, the cops only their officer's sticks. The rat thieves, who called themselves wet rats, lost like the proverbial wolves to the cats who chased them. 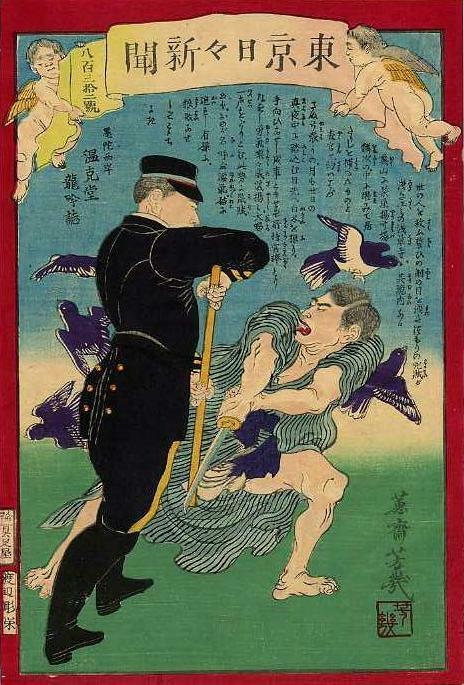 According to the newspaper article on which the writer based this story, the incident took place at three in the morning at an archery gallery (揚弓場 yaukiuba, yōkyūba) called Shōjutei (松寿亭). 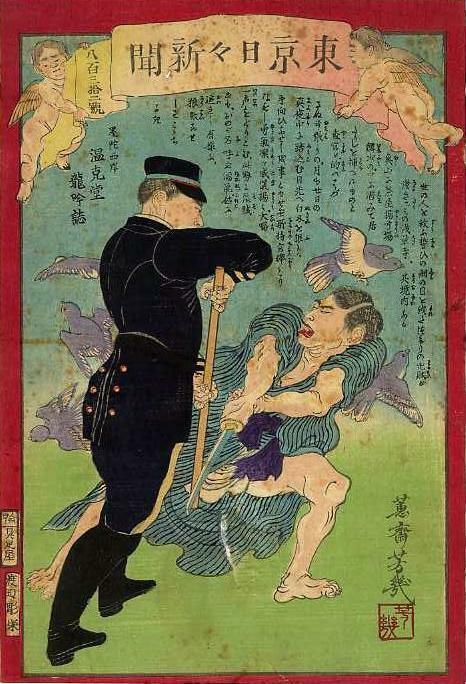 Some 40 to 50 patrolmen converged on two outlaws (賊 zoku) who had drawn their swords. The police had staked out the area and chosen the time and place to catch their prey. bad guy reflects 兇賊 (凶賊) -- "kyōzoku" in Sino-Japanese, but here read "warumono". rat outlaws (鼠賊 sozoku) were petty thieves and other such minor pests. wet rats (濡鼠 nurenedzumi, nurenezumi), while literally referring to wet rats (and hence, here, petty outlaws), was also a metaphor or simile for people who got drenched with their clothes on. 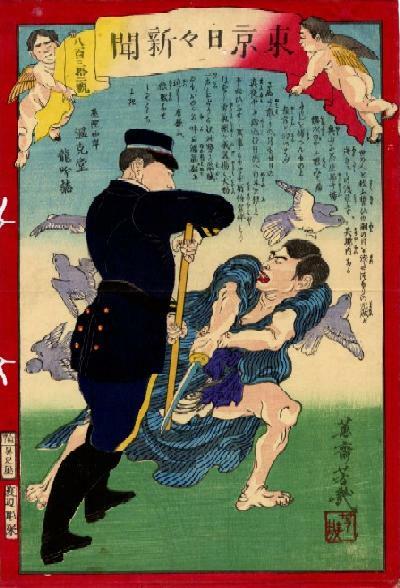 officer's stick reflects 官棒 (kuwanbou, kwanbō kanbō) -- later, and now, 警棒 (keibō) -- police nightstick, billy (club), truncheon.